No, this enormous diesel powered beast is not a discarded movie prop from James Cameron's Aliens. 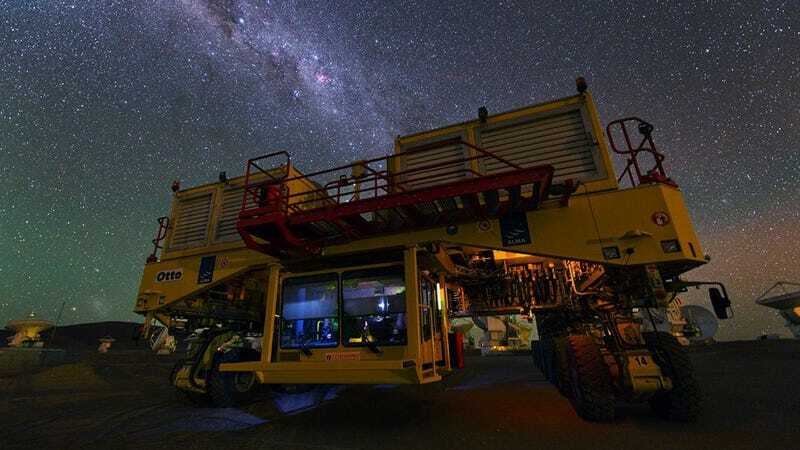 He is Otto, one of the two huge transporters of the Atacama Large Millimeter Array radio telescope field, at the high site of Chajnantor Plateau, Atacama Desert, Chile. They measure 20 meters long, 10 meters wide and 6 meters high, spreading their 130-ton weight over 28 tires. Each transporter is powered by a 700HP diesel engine (actually only about 450HP given the altitude and thinness of air) and carries 3000 liters of fuel. And if you thought it was tough for the engines to breath up there, the backrest of the driver's seat is shaped to allow him to wear the necessary oxygen tank while driving. These two vehicles top out at a brisk 20 km/h or 12 km/h when carrying an antenna.